FILE - Cambodian former opposition leader Sam Rainsy. Cambodia's former opposition leader, Sam Rainsy, called on Sunday for Cambodians to boycott a general election set for July 29 if his dissolved party isn't allowed to take part. 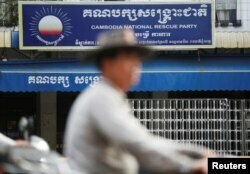 The Cambodia National Rescue Party (CNRP) was dissolved by the Supreme Court last November at the request of Prime Minister Hun Sen's government, which alleged it was plotting to take power with the help of the United States. FILE - Supporters of Kem Sokha, leader of the Cambodia National Rescue Party, stand outside the Appeal Court during a bail hearing for the jailed opposition leader in Phnom Penh, Cambodia Sept. 26, 2017. "I call on all my Cambodian fellow compatriots who believe in democracy to boycott the 29 July 2018 elections if the CNRP is not allowed to participate," Sam Rainsy said in a tweet on Sunday. Sok Eysan, a spokesman for Hun Sen's ruling Cambodian People's Party, said Sam Rainsy's call would have no impact. "The CNRP is already dead by the Supreme Court's decision," Sok Eysan said. 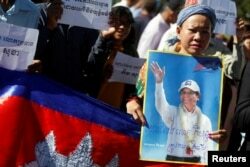 "Even if Sam Rainsy appeals until he dies, people no longer believe him." "Everybody can have their own idea what is free and fair, but free is free and fair is fair," Norio Maruyama, a Japanese Foreign Affairs spokesman, told a news briefing. A former deputy president of the CNRP, Mu Sochua, said Cambodians expected Japan not to recognise any government that emerged from a "sham election."